[PRWEB | Vancouver, June 25, 2015] Vitrium™ has added a free “risk grader” tool to its website that allows visitors looking for copyright protection, or protection of sensitive information, to quickly assess how at risk they are for a document security breach. With all the security breaches and cyber security attacks on front page news these days it’s hard for organizations to assess if they are truly at risk for a breach or leak, and if so, what steps to take to mitigate the risk. Vitrium’s new “1 Minute Risk Grader” enables companies to get a quick on-the-spot evaluation of their document security risk. The assessment also provides a few helpful actions organizations can take immediately to lower their risk should there be a high-risk evaluation. Several risk factors are chosen for assessment, including whether the company has a leader in a security position (CISO) and a document security policy, plus how documents are commonly shared and the type of information is in them. 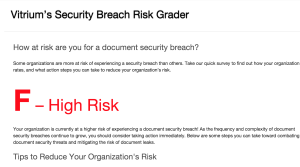 Based on this assessment companies can then begin to determine if they have a need for a document DRM system, encryption for sensitive documents, or copyright protection.The risk grader can be found at Vitrium’s website, www.vitrium.com/risk-grader. Interested in Protectedpdf? Need integration with your systems? Find out what Vitrium can do for you.